Not that this particular gathering was a positive thing. The Hug was a protest action in response to the layoffs, announced in December, of the Athenaeum’s library staff. Since 2010, Powers, 40, has been executive director of the 142-year-old institution, founded in 1871 by Horace Fairbanks, son of a successful scale manufacturer. Presiding over the legacy that the Fairbanks family created for the community but did not endow, Powers and the trustees cited mounting, unsustainable financial duress as the impetus for the layoffs. But many St. Johnsbury residents felt that abruptly dismissing their beloved — and, in some instances, long-serving — librarians was an unacceptable remedy. In the weeks since the Hug, the spotlight on the Athenaeum has scarcely dimmed, given the drama of eight library staff layoffs, three board member resignations, one copresident of the Friends of the Athenaeum resignation and five new library staff hirings. Soft-spoken and quiet, Powers is not the kind of person you would expect to find at the center of a maelstrom. And, in fact, he has largely managed to stay out of the media coverage — board chair Bill Marshall has been the Athenaeum’s spokesperson. “You’re only the third person so far who has asked me for an interview,” Powers told Seven Days. The way to Powers’ office goes through an inconspicuous door at the back of the library’s fiction room, near the entrance to the gallery that houses a famed collection of Hudson River School paintings. Up a flight of stairs, in an uncluttered, wood-paneled office, Powers sat at a desk near a photograph of a sequoia. The tree, which can live 3000 years, is an apt symbol for withstanding the winds of change. Powers grew up in Essex Junction and earned his master’s in American and New England Studies at the University of Southern Maine. Before taking a job at the Athenaeum, he was the assistant director of education at the Remick Country Doctor Museum and Farm in Tamworth, N.H., followed by a 13-year stint as director of the Sandwich (N.H.) Historical Society. Both positions, he indicated, placed him in a milieu of scholarship beyond the classroom, history beyond the display case, and museums engaged in the community. No one would deny that the Athenaeum owns stunning treasures that deserve to be more widely seen. Yet, with operational expenditures exceeding income for at least the past three years, Powers has had to address the budget first. That has involved difficult and controversial decisions. Asked about letting go experienced librarians, Powers paused for a long moment before offering soberly that he saw no other way. Even with his limpid blue eyes and open face, Powers sometimes has the blanched look of a person under prolonged strain. “It’s been hard,” he said. Indeed, public disgruntlement has taken the shape not just of letters to the editor of the Caledonian-Record but of personal confrontations with him and members of his family. Plenty of critics question that view, including members of a group calling itself the Neighbors in Support of Athenaeum Library Staff. At a meeting on February 2 — to which the Neighbors invited the board, and the board declined — a former Athenaeum trustee asked why the board meetings were no longer open to the public, as they once were. A town resident wondered how the board intended to replace five vacancies, and whether the public would be allowed input. Before town meeting earlier this month, the Neighbors published in the Caledonian-Record a notice of no confidence in the Athenaeum’s board of trustees. While the Athenaeum does offer free membership to St. Johnsbury residents ($15 for others), this does not confer the voting privileges typical of other membership libraries, a species of 19th-century institution that is increasingly rare. Nor does the slim income from memberships come close to covering the institution’s annual budget of $560,000. The Athenaeum requests $115,000 annually from the town of St. Johnsbury. At town meeting, that appropriation was easily granted once more, but it is just 18 percent of the Athenaeum’s total operational budget — one of the lowest per-capita appropriations for a library in the state. The layoffs were part of the institution’s strategy to cut expenses. The Athenaeum’s new, smaller staff consists of librarians Donna Stinehour, Shara McCaffrey, Alex Lent and MacKenzie Ross, and curator Bob Joly. And how does he propose to balance the budget? Through the kinds of partnerships and collaborations that he’s successfully implemented in the past, he said. “We have to create our own Athenaeum activities, harnessing our unique voice and expertise in humanities and American studies,” Powers asserted. By this he means not just hosting existing statewide lecture programs but launching signature programs. 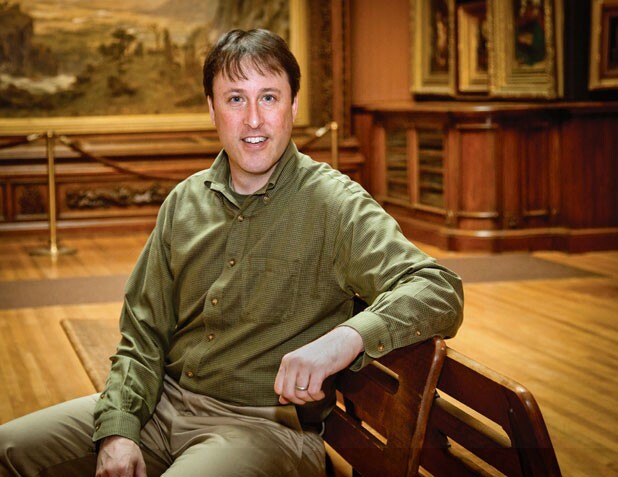 He means the Arts and Culture Series, which taps the indigenous talents and expertise of St. Johnsbury-area artists, art historians, scholars, authors and others for monthly presentations. And he means the Capstone collaboration with St. Johnsbury Academy, in which students capitalize on the Athenaeum’s unique history and collection materials to research and create presentations. Then there are programs underwritten by local businesses, individuals and foundations, such as the Acorn Club, which promotes literacy in 2-to-4-year-olds by bringing the children’s-library materials to area preschools and daycare. “If we are doing our job,” Powers said, “and offering innovative programs and utilizing dynamic partnerships, then this shared value will hopefully translate into increased revenue and support. “We could just show up every day and open the doors and that’s all, but there’s so much more we can offer … we’re an Athenaeum,” he continued, harking back to the name derived from the temple devoted to Athena, goddess of wisdom, civilization, mathematics, the arts, crafts, law and justice. Meanwhile, the Neighbors are still hoping for productive conversations with the board.